I'm so excited for summer to be here! I love chilling in the garden with a cold drink (this year it will be a soft drink instead of a cider) and an ice cream! I love relaxing outside, having a BBQ with family. 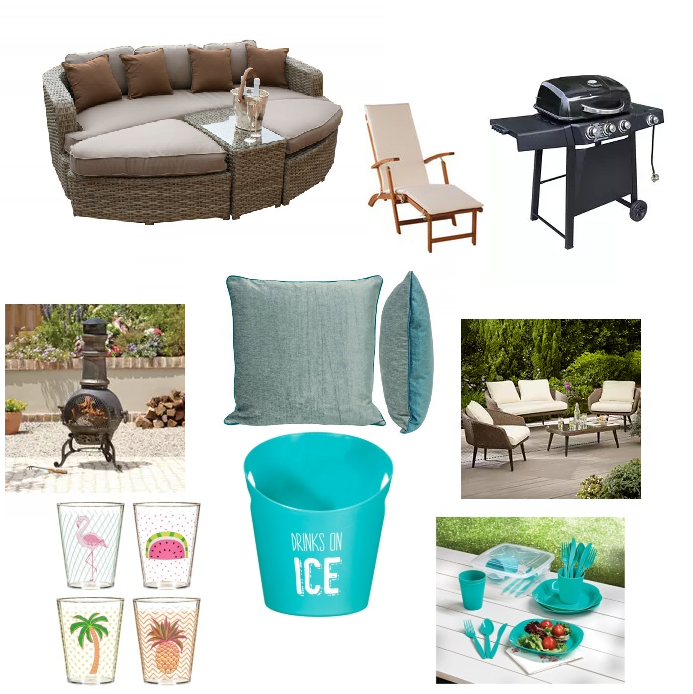 Today's post is all about getting your garden summer ready! You don't need to spend a lot of money to get your garden looking fab this summer! First up get yourself some decent seating! How gorgeous is this Rattan Daybed it looks so cosy! It's from Fishpools.co.uk and they have a huge range of garden and home furniture to choose from so they have something for every garden. If you don't fancy a daybed then you could opt for a dining set or something more comfortable like this sofa set from Asda! As I said I love having family BBQ's, you don't need to invest hundreds in a big fancy BBQ, you can get them from places like Asda and Argos without spending hundreds! You could even opt for a few disposable BBQ's they are just a couple of quid! I like to sunbathe in the garden so we have a couple of sun loungers that we get out of the garage in the summer! I love this wooden one from Argos. The last thing your garden needs for the summer is some accessories! Cushion and throws are not very expensive but can make a garden feel really cosy and more luxurious! These cushions are also from Fishpools. Stock up on plastic tumblers and plates to make eating outside safer, you don't want broken glass everywhere. These cool tumblers are from B&M bargains as is the plates set and the ice bucket. I hope your all as excited as I am for the summer! Why don't you spend your weekend getting the garden looking tidy and invite some friends over for a BBQ?